Strawberry… One of the most popular flavors of sweets. Who wants to do without it? 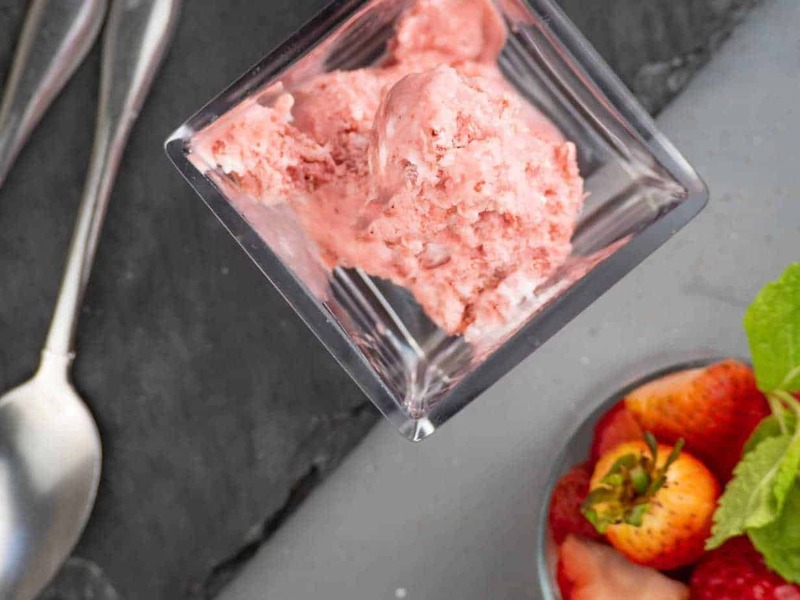 Dig into some awesome keto strawberry ice cream for your next dessert! 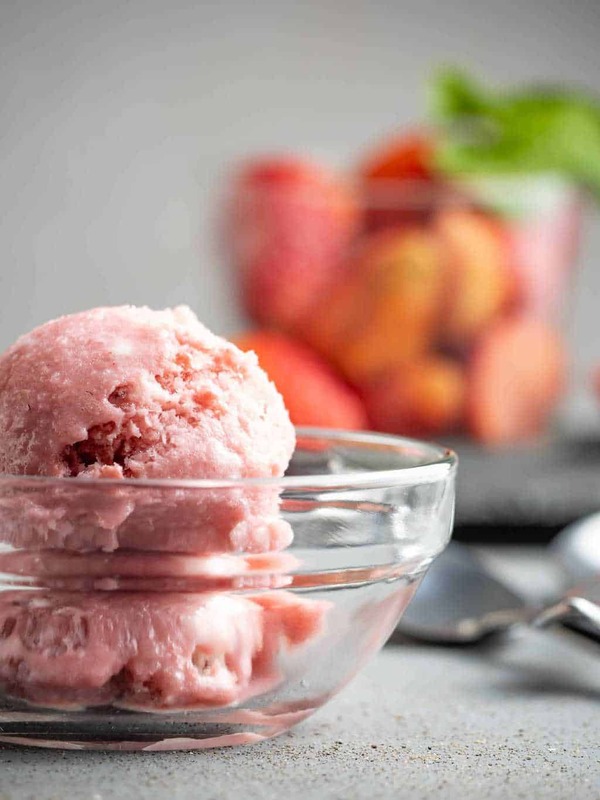 You’ll need the following ingredients to make this delicious strawberry ice cream. Using a high-speed blender, blend all ingredients together for a few seconds. Be careful to not whip the cream by mixing too much! Pour blended mixture into your ice cream maker (ice cream maker information below). WHAT TYPE OF ICE CREAM MAKER SHOULD I USE? There are three main types of personal ice cream makers on the market today. Each one has its pros and cons. One is certainly the best but also carries a high price tag. These ice cream makers are all discussed briefly below, so you can decide which type is right for you. These are the simplest ice cream makers on the market. They use the concept of ice in a bucket, which surrounds the mixing canister. The motor is located on the top of the bucket and does all of the heavy liftings. The motor rotates the mixing canister inside the ice, keeping the contents cold as it mixes. While these machines are simple (and subsequently very cheap in comparison to the other types) they are very effective. It might seem simplicity doesn’t always equal effectiveness, but in this case, it does. 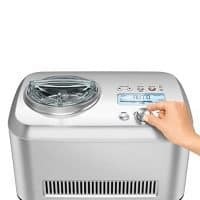 If you are an avid ice cream maker or an amateur making a batch every once in a while, this ice cream maker is for you. Possibly the least effective ice cream makers are of the frozen bowl variety. These use the concept of a pre-frozen bowl surrounding the liquid ice cream mixture to cool it and freeze it. While these machines do work, they require a lot of upfront time to freeze the bowls properly. Some of these advise freezing the bowl in your freezer for up to two days before use. The problem with these ice cream makers is that the bowl will often warm faster than it is cooling, especially if the mixture isn’t very cold, to begin with. A few independent tests of these machines often find the mixture to become more like a milkshake than actual ice cream. However, most of these models are more affordable than some of their counterparts. They make a good ice cream maker for those who make ice cream irregularly or aren’t sure if making ice cream is for them. This is by far the best ice cream maker option. By utilizing a compressor, the machine is able to freeze the mixing bowl (often ahead of time) and can keep it the proper temperature during the mixing process. This also helps to make the ice crystals in the mixture smaller, meaning a better mouthfeel and texture of the ice cream. Some machines are even equipped with extra sensors and settings that allow you to set the thickness of your ice cream or mix other items like sorbet or gelato. We consider these machines to be the best due to their more commercial style, mixing, and cooling capabilities. However, a quick Amazon search will show you that with this higher quality, comes a higher price tag. Is it worth it? The answer to that is up to you, depending on how often you make ice cream and what your budget for kitchen gadgets is. If the answer is yes, you certainly won’t regret it. WHAT SETS THIS ICE CREAM APART FROM OTHERS? First, this ice cream uses as few ingredients as possible. 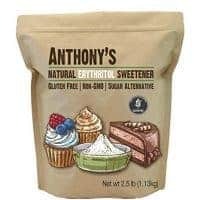 There are no fillers, additives, or other non-essential items found on the ingredient list. Secondly, the use of erythritol gives this ice cream a sweet, but not overly sweet, taste. This is, of course, all while keeping blood glucose levels low unlike sugar and some other artificial sweeteners. IS IT POSSIBLE TO MAKE THIS ICE CREAM WITHOUT A MACHINE? You can, but it isn’t easy. You should use the Mason jar method to make ice cream without an ice cream machine. It requires some work on your behalf, and the final product won’t have the awesome texture a machine will give it. However, if buying an ice cream machine is not for you, doing this will net you a tasty product after a couple of hours. Storing your homemade keto ice cream isn’t difficult. There are, however, some tips you can use to ensure your ice cream is stored in as best a way as possible. Keep in mind, warming and cooling ice cream too much will result in a change in texture as ice crystals reform without being mixed! HOW LONG WILL THIS ICE CREAM LAST? Unlike commercially processed, packaged, and stored ice cream, this ice cream will last roughly a week in your freezer. The commercial alternatives are produced in a way that allows them to remain frozen longer. If you store this using some of the storage methods discussed above, it is possible for the ice cream to last longer. Otherwise, make plans to eat your ice cream in seven days or less after you make it. WHAT IS THE EASIEST WAY TO SCOOP THIS AFTER BEING FROZEN? Run an ice cream scoop (or large spoon) under warm/hot water for a few seconds. Then, scoop a spoonful of ice cream into a bowl or other serving dish. Repeat this process until you have the needed amount of ice cream scooped out. The warm water helps to warm the spoon or scoop and makes “cutting” through the cold ice cream easier. Strawberry... One of the most popular flavors of sweets. Who wants to do without it? Dig into some awesome keto strawberry ice cream for your next dessert! I have a Ninja but no ice cream maker. Do you have a method without an ice cream maker? If you give it a blend, you can probably use the Mason jar method. Give it a blend, pour into a Mason jar, and freeze. After it freezes, remove and leave it out for a few minutes. Scoop and serve. Hope this helps!